Kimberly Jolly, owner of The Fat Quarter Shop, came to visit my little studio to film a LIVESTREAM! ​I provide Long Arm Quilting Services for It's Sew Emma and The Fat Quarter Shop, and I’d love to work with you too! I'm currently accepting new clients with a turn around time of 1-4 weeks. This means that I can add design elements to enhance that special show quality quilt by using ruler work, & free motion designs. Or, I can also offer digital edge to edge computerized pantographs too! If you are ready to mail a quilt top, I would love to work with you!! ​Please fill out the google form below, and then send me a text, give me a call, or email me. I love new quilty friends!! 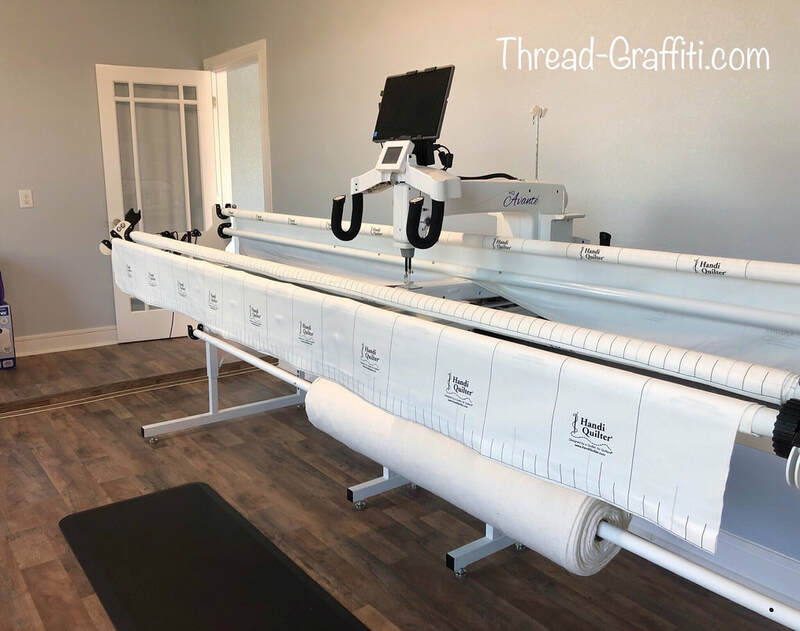 I have a NEW 10 Foot Handi Quilter Avante long arm machine with Pro-Stitcher Premium computerized system, this means anything bigger than 100 inches is too big for my machine. Digital Computerized Edge to Edge Pantograph. (E2E) this option will give you perfect edge to edge designs guided by the computer. This is the most cost effective option, yet still looks great, and is wonderful for a quilt that will be used and washed often! This option offers one thread color and I can turn these around very quickly. As a celebration of my new shop, Inam happy to stock your favorite panto at NO additional charge! Semi Custom Quilting...this option will offer some elements of repeat computerized and custom freehand combined, this option is specific to each quilt and details will need to be discussed before you mail your quilt. Price STARTS at $.06 per square inch, while labor time is also considered in the final cost. Full Custom Quilting...this option is custom free hand quilting that I add free hand design elements to enhance the pattern. These designs can be done through ruler work, or free motion designs. Your quilt with have a unique artful design that will be like no other quilt, these quilt details will need to be discussed before you mail your quilt. Price STARTS at $.06 per square inch, while labor time will also be considered in a final cost. Maximum width we can quilt is 100 inches. I can stock large rolls of Pellon Brand 80/20 Cotton batting for $.30 per inch, or you may send your own batting if you prefer, but please remember your batting must be at least 2 inches larger on all four sides. but you will need to request this in advance. There will be a standard $8 Needle & Thread fee per quilt. Postage is the responsibility of the client, we recommend sending your quilts via the US Postal Service using the flat rate boxes, these include tracking and insurance in the cost of the box. Press the quilt top and backing. If your backing will have a seam, try to place the seam horizontally across the width of the quilt for best results. Please trim all loose threads from the quilt top, on both sides. Dark threads will show through white fabric if not trimmed prior to quilting. Backing must be at least 4″ larger than the quilt top on all sides. Mark the top of the quilt with a pin and post it note, do this for both the quilt top and the backing so I know what end will be the top. The backing for the quilt must be square. It cannot be properly loaded if it’s not square. Please give me a heads up before you mail a quilt. You can reach me by phone, email or text before you mail a quilt. I want to make sure you get exactly what you want, and I want to make sure your quilt gets here safely. I am happy to help in any way that I can. Buy One Get One HALF OFF ! provide me the charity info so I can post pictures and keep track in my bookkeeping system.